You want to play a cardgame or Yahtzee with your Friends, but you don't have an notebook with you to write down the score? You want to create a tally sheet? No problem with Scoreboard for iPad! 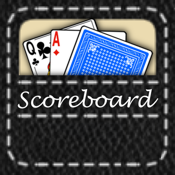 Just grab your iPad and create a new Scoretable with unlimited Players and automatic calculation. If you want to play Thirty-one Scoreboard even supports optimized Input methods and automatic analysis! You just have to enter the results for each round and Scoreboard will tell you who lost and who won! Scoreboard also has an integrated Yahtzee-Table with optimized Input methods, that automatically calculates the Score and Bonus. Even the Yahtzee-Table supports and unlimited number of players! Scoreboard has even an optimized Scoreboard for Phase 10, that automatically detects in which Phase you currently are and it also offers an overview of the different Phases! Furthermore you can create a tally sheet with unlimited Players/Categories and start counting to infinity! If you want to take a break while playing or if you just want to save your great score you can just save the table and load it again later and continue playing. You can even send your Results to your friends with an Email right out of the App! ✓ All the tables can be saved and loaded again! ✓ Share your Scoreboards with your Friends! If you like this App please leave a Review!